After I had moved, my family and I decided it would be helpful to talk about the contrast or difference between where we used to live and where we live now. I could think of one main contrast or comparison of how things were not the same: our previous town was big and this one is small. Another contrast or how the two towns were not similar lay in how much better the school is where we go now and how poor the other one was. There was one last contrast or difference, however, that was very hard for me—my old friends were not like my new friends at all, and I miss my old ones very much! Quiz: Try again! What is happening when a contrast is shown between two things? The likenesses between the two things are shown. Qualities that are different between them are pointed out. The qualities of each are listed. A contrast between two things is a comparison of them by showing how they are different from one another. Falcon and Fast A falcon and fast do not contrast, for a falcon is very fast indeed! When two things are compared, those qualities which “stand opposite to” each other form the contrast between the two things. 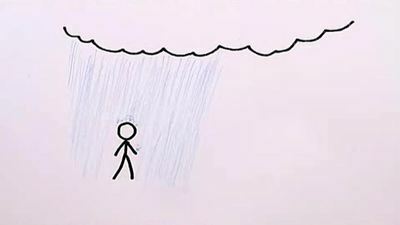 One Minute Physics [YouTube] Is walking or running the best way to stay drier when it is raining?